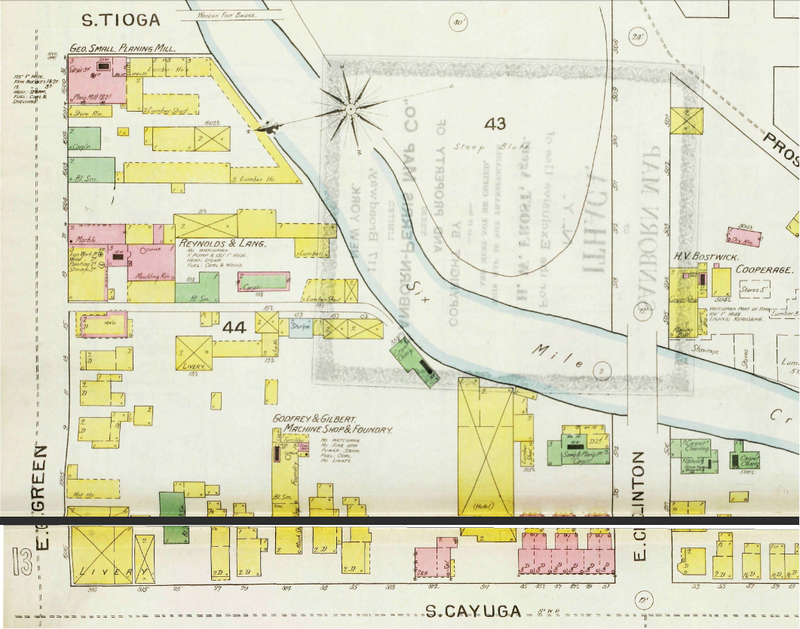 This post was inspired by two events – a reader messaging me and asking about historic maps, and another reader telling me about the history of the Cayuga Place/Lofts @ Six Mile Creek site. In both these cases, I ended up looking at Sanborn Maps. 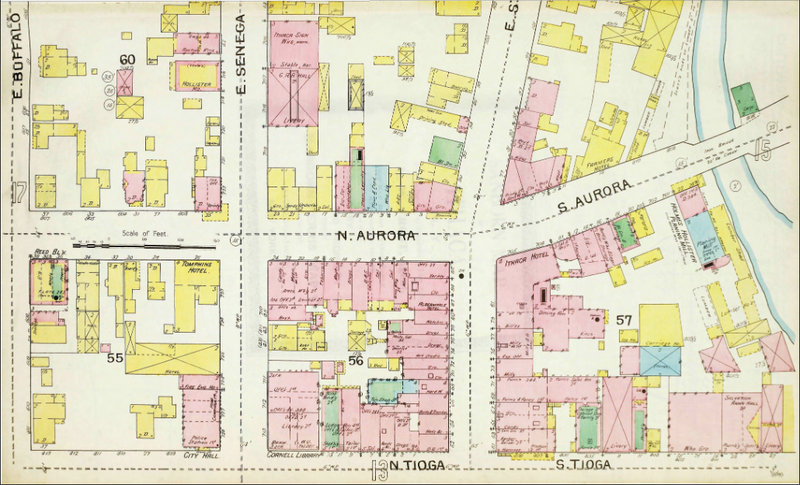 Sanborn Maps were created in the late 19th and early 20th centuries as a way to gauge the amount of fire insurance a site needed. A bunch of things come into play when gauging fire insurance – other structures nearby and their uses, geographic features, width of adjacent streets, fire walls, railroads, building materials, and so on. These maps, as exhaustive of a task as they must have been for surveyors, were crucial in determining the right price for insurance coverage. According to the wikipedia article, agents “relied upon them with almost blind faith”. The company was very successful and produced maps into the 2000s, and Sanborn was an early investment of Warren Buffett in the 1960s. 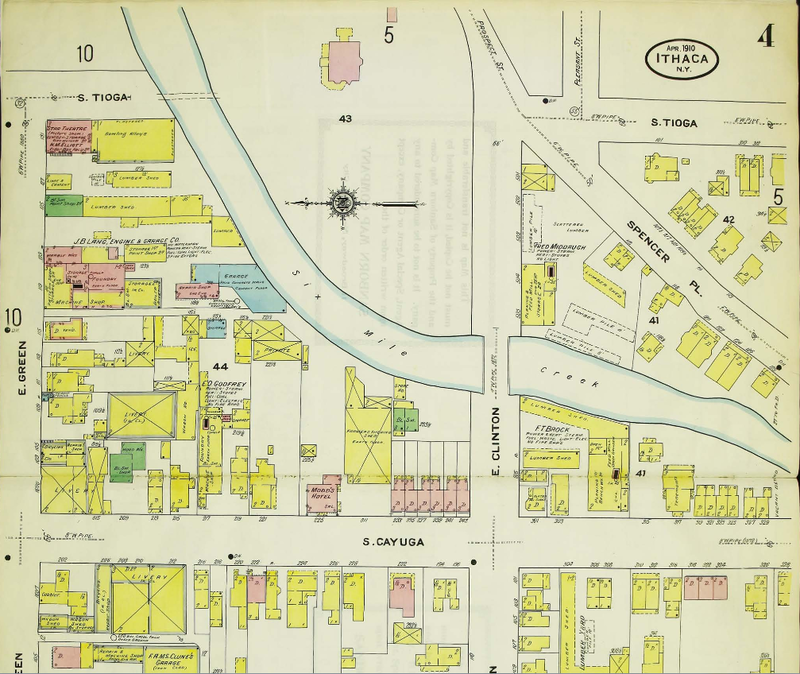 Today, the maps are owned by their successor, Environmental Data Resources Inc.
With all that noted, Sanborn Maps are a veritable treasure trove of information. Ithaca and Tompkins County were included in the first Sanborn volume published in 1867, and every few years henceforth. While the 1867 map doesn’t appear online, 1866 maps from a rival publisher can be downloaded from the Tompkins County Public Library here. 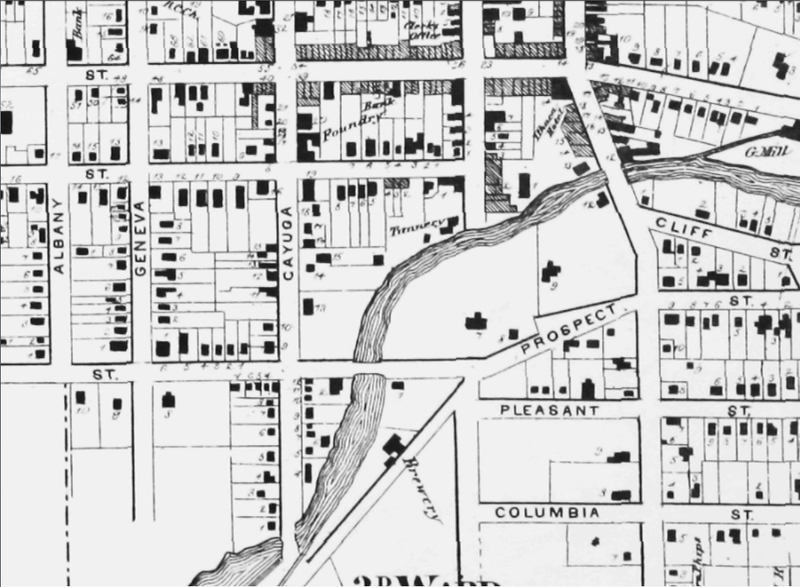 The 1866 Ithaca map was the same one I used in my “A Walk Down Varick Street” post from last Spring. The other Sanborn volumes listed on TCPL’s website date from 1893, 1904, 1910 and 1919. Between published volumes, updates would be sent out on “slips”, sheets with the updated lot details that one could paste into place on top of the old map. There are also 1888 and 1898 copies, which are proprietary and therefore can’t be linked. The same holds true for any map not published by the government after 1922, which takes out the Sanford Maps from 1929, 1957, 1961 and 1971. These newer maps can still be accessed for academic use at Cornell’s Olin Library. So for the sake of example, I’m going to use the Lots @ Six Mile Creek site and its surrounding block, since I’m already acquainted with it. I’ll lead off with the 1866 map. #13 Cayuga is a small hotel, #16 a doctor’s office, #18 a “Select School” and #19 a livery (horse stables). All the others (excluding the one labelled “Tannery”) are homes. Fast forward 27 years to 1893. On the corner of S. Cayuga and E. Clinton are 3-story rowhouses. A carpet maker sits to their north, and the hotel next door has expanded in the past couple decades. The corner Livery is still there, as are most of the homes. A machine shop sits where the doctor’s office used to be, while Reynolds & Lang (a maker of farm equipment) and George Small’s Planing Mill fill out the east end of the block. Now for another jump, 11 years forward to 1904. The hotel is now a “Farmer’s Hitching Shed” with an earth floor, and the small 2-story building next door is the Forest City Hotel. Many liveries filling in what was once open space, and the planing mill and farm equipment factory have updated names as a result of new business partners. Only a few years later in 1910, the planing mill has moved and the Star Theatre and a bowling alley have taken its place. A concrete garage now sits next to the creek, a bicycle shop and a clothing store sit next to the livery on the corner of Green and Cayuga, and the Forest City Hotel has become Mobb’s Hotel. By 1919, it all starts to get a little jumbled. The change in orientation doesn’t help either. The Star Theatre is now a furniture warehouse and the corner livery is a garage. Without linking to the images of the later maps, I can at least describe what happens. By 1929, Cayuga Street is automobile row, with Hudson-Essex, Nash and Buick dealerships. A large parking garage is built on the east end of the block. Some houses on Green come down for the Cayuga Press printing plant. 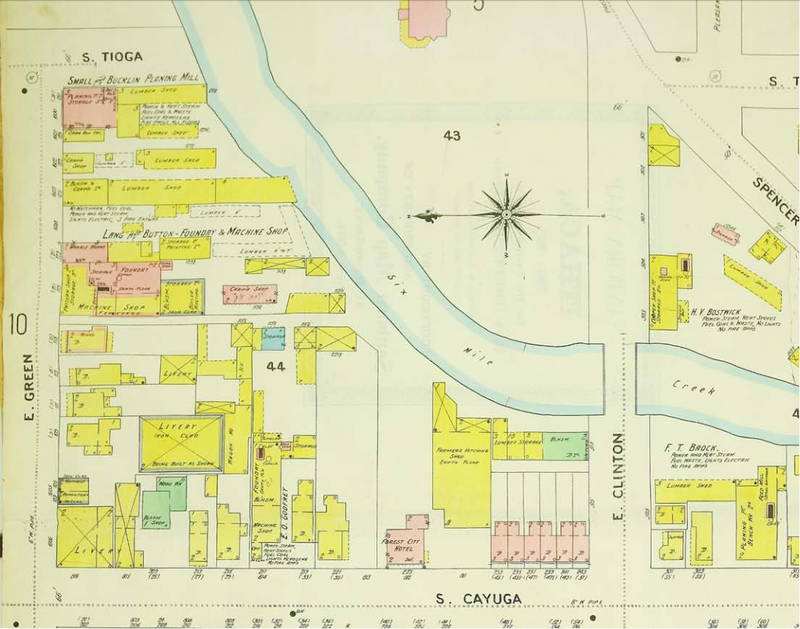 The 1961 map shows nothing but Cayuga Press and autocentric development, parking garages and car dealerships and gas stations; the corner townhouses are gone, as are most of the other houses. The whole block is levelled for parking lots and a department store by 1971. The vacated store became the library in 2000, the parking garage went up in 2005, and the apartments have followed. But you can read about the recent work here. For a budding history buff, the Sanborn maps are a great way to kill a few hours. It also makes one realize just how much downtown Ithaca has evolved over the decades. Great info. I’ve spent at least an hour on the 1919 map. I’m sure I’ll spend more time than I should on the others. Thanks for the links BC. Hello Brian. I was recently referred to your blog post regarding the Sanborn Maps by someone who took notice of the map we have here at our offices – 421 North Aurora St. I found this map at Hubs Place rolled up wet and falling apart and had it partially restored. It is an FW Beers & Co map from 1889. 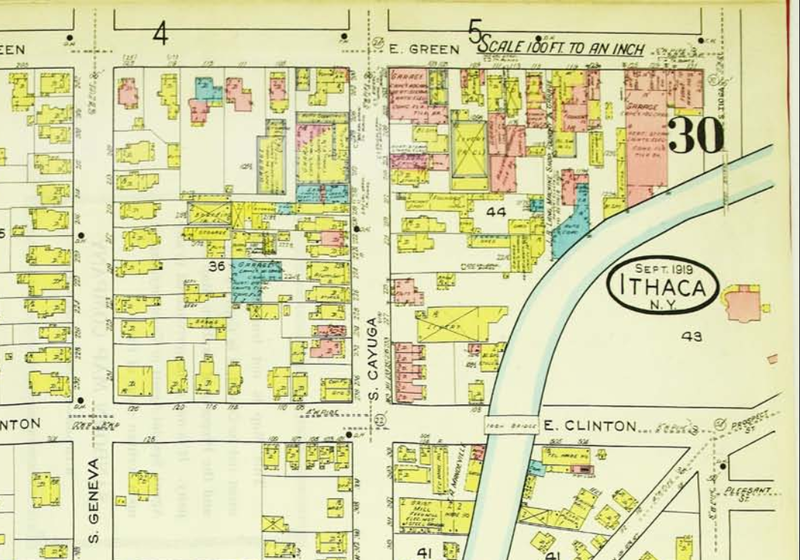 I have seen quite a few rare Ithaca maps over the years – also with property owner names – but have never seen this particular map. Bill Hecht somehow heard about it and took some pictures – which are now available on line. Feel free to come have a look.